The Children Place. Length: 24". Pink dress and white shrug by The Children’s Place in size 10, lovely for spring and Easter. Zippers up the back, fully lined with crinoline skirt. White shrug is also by The Children’s Place. Buttons at front, long sleeves. In a NAVY BLUE AND WHITE STRIPE WITH SEQUINS AND A TULLE RUFFLE HEM in excellent condition! Very gentle worn girls Dress in size 8 . Black and white in color . Decorative bow up front and bully lined . Collar decorated with black shiny sequences . Great for Holidays to come . All sales final. Comes from my smoke / pet free home . Winning bidder to submit payment within one day please. Girls size 8 dress from The Childrens Place. White with black 'ribbon' swirls and flowers all over. Tulle underskirt - but lined so it's not itchy. Looks good with a black shrug or sweater. The pictures do not do this justice. Beautiful girls sleeveless dress from The Children's Place, size 10. Mint green, with beautiful allover floral lace design on front, decorative flower, fully lined, extra netting layer to add flounce. Pretty light blue dress with lace and ruffles in 100% cotton with 100% cotton lining. No known flaws. Style - Drop Waist - Pleated - Sleeveless - Round Neckline - Knee Length. Care Instructions - Machine Wash Cold - Tumble Dry Low. Color - Red - Black - White. Length - Back Center - 24 1/2. Here is a dress by Children's Place.size 16.this dress is sleeveless. it has a open floral design for the top layer in yellow and white. with a solid yellow layer underneath.the skirt is full. Let this fabulous vibrant bold blooms pattern outfit be her new favorite from the children’s place . Dress is accentuated with functional removable faux leather belt with attached center flower, a super silky floral skirt layered with a white tulle and silk lining. This gorgeous frock has a lace front , solid back top, cinched & elasticized waist . A great choice for all kinds of special events. Imported. Machine wash cold gentle cycle. BODICE - 60% cotton, 40% nylon. SKIRT-100% polyester. CORPS - 100% Cotton. CORSAGE AVANT- 60% cotton,40% nylon. Polyester/Spandex blend dress. Gray velvet with sparkle beads sewn throughout. Cap sleeves. Zip in the back. Girls Dress. Belt around the waist which ties in the back, zipper up the back for closure. Layers on the bottom for a full look. Fancy and nice for formal party or other such dressy occasion. Worn once to a wedding and inexcellent condition. Here is a lot of 4 girls dresses. The second dress has 3/4 length sleeves.it is on the short side. It is a solid light pink in color, with a poplin-like texture. It has a concealed 10-3/4" zipper down the back, for ease in dressing and changing, and two large flat front pockets. It falls around knee length, depending on height. Size 7 - Teal and green tie dyeish Dress - Speechless. Size 7/8 - Pink, blue, green, teal, white horizontal striped sundress - The Children's Place. Pale green bodice with horizontal tucks. Girls' Children's Place 100% Linen Dress, as pictured. Green trim on hem of attached satin slip peeks out about 1/2". Bodice is lined with 100% polyester satin fabric. Justice, Children's Place, & BeBop (from Nordstrom Rack) Girls' Dresses - ALLSize 8. BeBop Dress. Justice Long Dress. Children's Place Dress. Green &Blue. THE CHILDRENS PLACE Girls ivory velvet dress, size 14. I would never intentionally misrepresent an item but since I am only human, things can get overlooked. We cannot solve what we are not aware of. The Children's Place NWT black and white tutu dress. Soft tool skirt, with lining. Sequins on a couple of the stripes across the chest area. Length- 31". Sleeves- 15". Waist- 30". The Children's Place Girls Black Faux-Leather Embroidered Lace Dress Size 6x/7. I have barbie clothing from 1960's to early 1990's listed as I go through my collection. Make sure you check out all photos and zoom in so you are aware of exactly what you are buying. Floral party dress with satin fabric. Girls Size 6 dress. Lined to make the dress look poofy. The Children's Place. THE CHILDRENS PLACE Girls dress, size 4. I would never intentionally misrepresent an item but since I am only human, things can get overlooked. We cannot solve what we are not aware of. CLEAN AND EXCELLENT USED CONDITION with no flaws or stains. Girls TCP The Children's Place Black and White Waist Band Dress - Size 6 Years - NWT! Girls Children's Place. Black and White Dress. GUC - GOOD Used Condition - Previously worn, with visible flaw(s), and/or significant wash wear/fade. Girls Sleeveless Cactus Bloom Print Maxi Dress. Allover cactus bloom print. Made of 100% polyester flat georgette. Adventurous maxi style in a super-cute print! Lining made of 100% polyester interlock. Good clean condition lined with petticoat. great party dress. Children's Place size 6 black and white polka dot dress with built in crinoline. Black ribbon with daisy in front ties in back. Excellent preowned condition with no tears, stains or fading. This is a gorgeous dress, the colors are amazing. EUC - Little to no signs of wash/wear and no holes, stains, or tears. Size ( 14 ) GIRLS color is PURPLE --- FLORAL. by CHILDREN PLACE DRESS. Length:39". Chest (from underarm to underarm) 15". 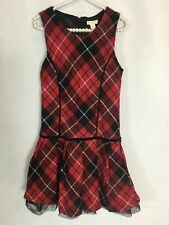 This is a super cute girl's size 10 Children's Place lined sleeveless dress. It has beautiful rhinestones around the neck area. It has a center rear zipper. The dress is 100% cotton. Waist band has elastic.